The book furnishes few data for a settlement of the time and place of writing. It is evident from iii. 8-10 that its "terminus a quo" is the fall of Noamon (Thebes) in Upper Egypt before the successful arms of Assurbanipal (668-626 B.C.) just after 664 B.C. In i. 9 it is foretold that the destruction of Assyria will be complete. This was accomplished about 606; and it constitutes the "terminus ad quem" of Nahum. Somewhere between these two points the date of the book is to be sought for. The two prevailing dates selected are (1) about 650 and (2) about 608. The reference to the fall of Thebes does not argue for the earlier date, as that disastrous battle would long remain in the memories of the adjoining peoples. Neither, on the other hand, does the vividness of descriptive detail fix absolutely the later time as the true date. The probabilities, however, are in favor of about 608 as the time of composition. 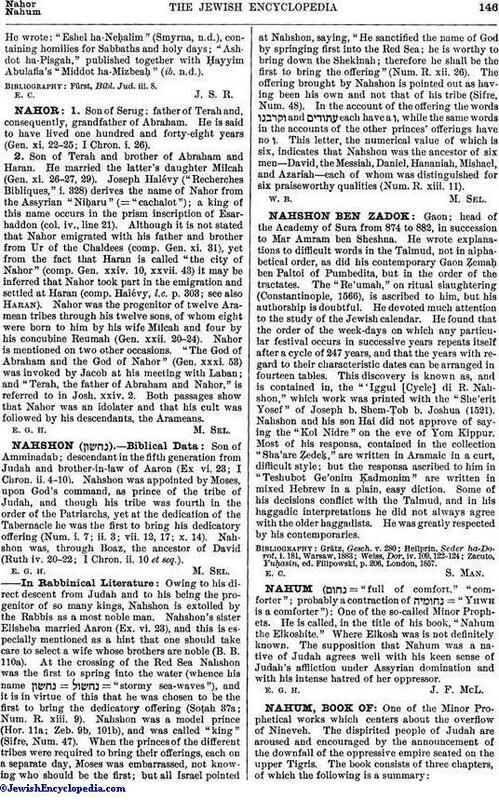 "Nahum the Elkoshite" is the designation of the prophet. His vivid description of Nineveh and his definiteness of detail have led scholars to search for his home somewhere within reach of that city. Alḳush, a place near Mosul, contains a grave said to be that of Nahum; but the tradition of this place does not seem to be older than the sixteenth century. On the other hand, Eusebius in his "Onomasticon" (ed. Lagarde) mentions an 'Eλκσέ of Jerome; and Jerome says, in his commentary, "Elcese usque hodie viculus in Galilæa." These statements would seem to locate an Elkosh in Galilee. In answer to the statement that the Northern Kingdom was carried into captivity, it may be said that probably, as in the Southern Kingdom (II Kings xxv. 12), the poor were left in the land. 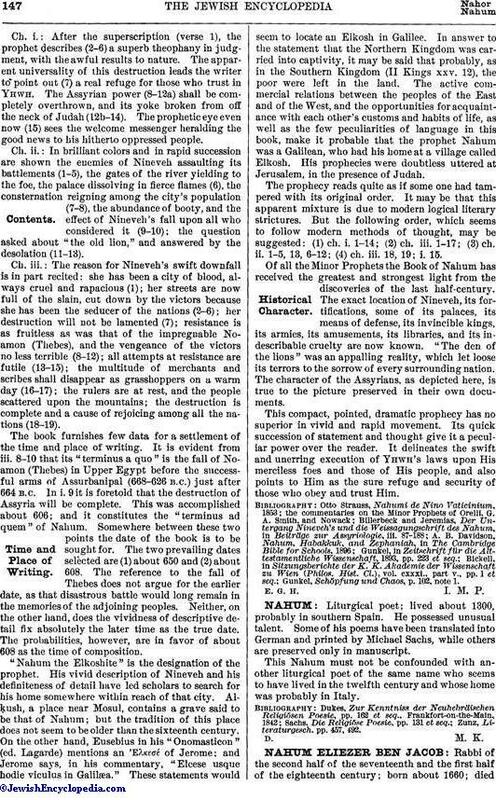 The active commercial relations between the peoples of the East and of the West, and the opportunities for acquaintance with each other's customs and habits of life, as well as the few peculiarities of language in this book, make it probable that the prophet Nahum was a Galilean, who had his home at a village called Elkosh. His prophecies were doubtless uttered at Jerusalem, in the presence of Judah. Gunkel, Schöpfung und Chaos, p. 102, note 1.